"Century City" redirects here. For other uses, see Century City (disambiguation). 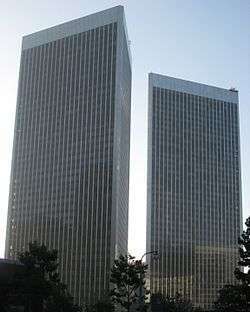 Century City is a 176-acre (71.2 ha) neighborhood and business district in Los Angeles' Westside. 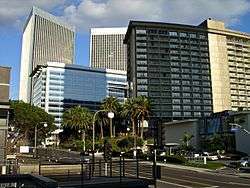 Outside of Downtown Los Angeles, Century City is one of the metropolitan area's most prominent employment centers, and its skyscrapers form a distinctive skyline on the Westside. 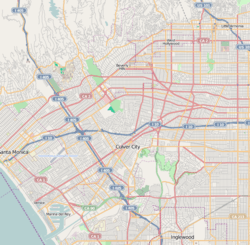 According to the Mapping L.A. project of the Los Angeles Times, Century City is bordered on the northeast and east by Beverly Hills, on the southeast and south by Cheviot Hills, on the southwest and west by West Los Angeles and on the northwest by Westwood. The land of Century City belonged to cowboy actor Tom Mix (1880-1940), who used it as a ranch. It later became a backlot of 20th Century Fox, which still has its headquarters just to the southwest. In 1956, Spyros Skouras (1893-1971), who served as the President of 20th Century Fox from 1942-62, and his nephew-in-law Edmond Herrscher (died 1983), an attorney sometimes known as "the father of Century City," decided to repurpose the land for real estate development. The following year, in 1957, they commissioned a master-plan development from Welton Becket Associates, which was unveiled at a major press event on the "western" backlot later that year. Westfield Century City and Fox Studios occupy important acreage in the neighborhood. As of 2016, Westfield Century City is currently undergoing an $800 million renovation and expansion that aims to maintain the center's status as one of the Westside's premier shopping and entertainment destinations. 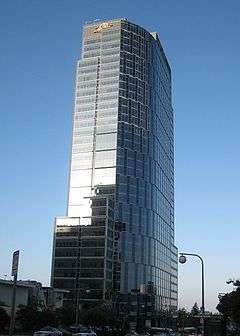 One tower, Constellation Place (formerly the MGM Tower), has the headquarters of Houlihan Lokey, International Creative Management, and International Lease Finance Corporation. Crystal Cruises is also headquartered in Century City along with haircare manufacturer, John Paul Mitchell Systems. Three private schools are located within the Century City neighborhood — VINCI Academy Daycare & Preschool, at 1940 Century Park East; Lycée Français de Los Angeles, at 10361 Pico Boulevard; and Temple Isaiah Preschool and Kindergarten, at 10345 West PIco Boulevard. ↑ Century City Medical Plaza, laconservancy.org; accessed December 15, 2015. ↑ Vincent, Roger. "Energy cells help power Century City skyscraper." Los Angeles Times. February 5, 2012. Retrieved on February 5, 2012. ↑ Steinberg, Julie. "Bucking the Trend, Houlihan Lokey Still Hiring." Finance (The Wall Street Journal). January 24, 2012. Retrieved on February 5, 2012. "Houlihan Lokey, the Los Angeles-based investment bank,[...]"
↑ Nash, James. "Lights, camera, Katrina: rebuilding of Louisiana will affect production in L.A." Los Angeles Business Journal at AllBusiness. Retrieved on February 5, 2012. "[...]International Creative Management Inc., the Los Angeles-based talent and literary agency." ↑ "Contact Us." International Lease Finance Corporation. Retrieved on 6 May 2011. "10250 Constellation Blvd. Suite 3400 Los Angeles, CA 90067 USA"
↑ "Contact Us". Crystal Cruises. Retrieved on January 20, 2010. "Crystal Cruises 2049 Century Park East Suite 1400 Los Angeles, CA 90067"
↑ "Article: Los Angeles-Based Crystal Cruises Moves to Nearby Location." PR Newswire. August 19, 1998. Retrieved on January 20, 2010. "Effective September 8, Crystal Cruises is relocating to larger headquarters a few blocks from its current location in the Century City area of Los Angeles, California."